The island of Patmos is both attractive for its religious cultural offer (monasteries, cave of the Apocalypse...) and for its unique panorama and beaches. Accessible by boat from Piraeus or the surrounding islands that have their own airports, Patmos is a quiet and welcoming island. 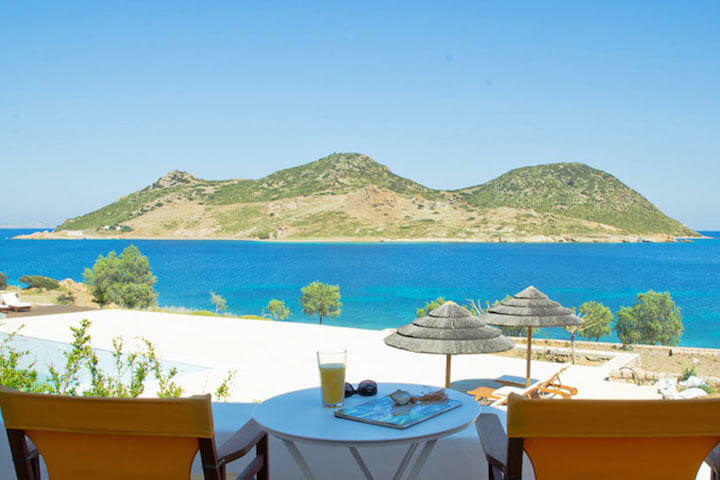 Villanovo offers villas in Patmos in the cities of Kampos and Chora the capital. Magnificent mansions in the middle of nature for the most part with a private swimming pool carved in the rocks. Traffic on the island is based on a common transport in caiques from the Skala, the only port on the island. These caiques join the North and the South of the island and the small islands (Agriolivado, Tragonissi, Hiliomodi...). 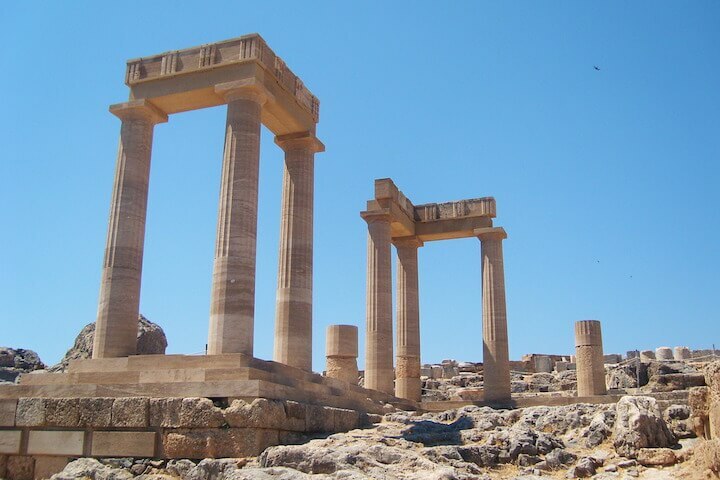 The island has been declared a historic monument since 1946 and proclaimed a "sacred island" by the Greek parliament since 1981. In 1999, UNESCO declared it "Patrimony of Humanity". A religious enclave, little touristy, it is protected by the disappointments of mass tourism. Being a small island (34km² of surface) it is easy to go by foot or scooter. The lively life will be centralised in Skala: restaurants, hotels, nightclubs and shops of the island. Chora is a simply wonderful village: alleys, stairs, corridors of immaculate whiteness. The walk on the old paved road may require endurance but it is superb. 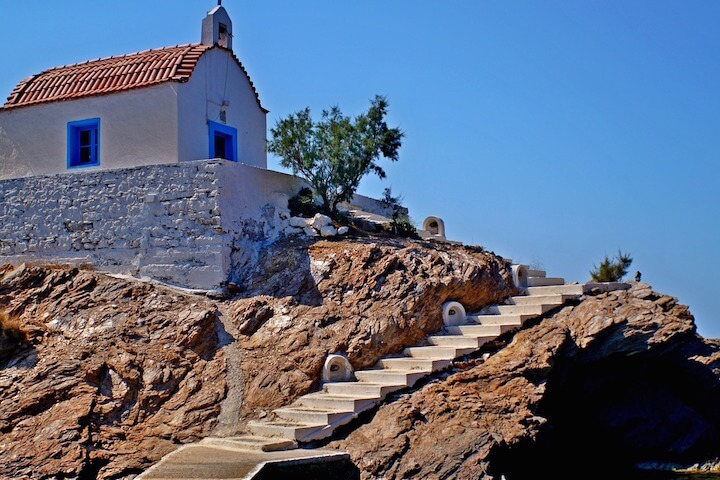 Between the port of Skala and Chora, the emblem of the island is claimed by the cave of the Apocalypse, where Saint John would have written The Apocalypse. The place is beautiful. Attention, you will have to cover yourself, no bare legs. You will be able to enhance this visit of the monastery of Saint-Jean. A former medieval fortress built in the 11th century, the church preserves superb frescoes, the refectory and the library are totally soothing. A paid museum contains valuable documents if you want to widen your search. The beach of Grikos at 4km from Skala, the nearest beach of Chora is a pretty sheltered cove. The sea urchins are numerous, you can fish in them, but have good equipment. Further to the South in continuity, the beach of Plaki is full of natural caves. Petra Bay is particularly loved by yacht enthusiasts for secluded and peaceful coves. To the South on the peninsula, the most beautiful beach of the island is in Psili Ammos, it is also the most frequented. One part accepts the followers of nudism. It is served by the caiques from Skala. If you decide to walk there, a bus leaves you within a half hour's walk, you will then have the opportunity to discover beaches of dried seaweed, deserted and beautiful. The quietest beach on the island is to the North near Lampi, completely covered with pebbles, a hostel will welcome you for lunch. The departure by caique is in the morning in Skala. The closest beaches to Kampos are Ormos Kampou and Ormo. They are less frequented than Psili Ammos but are very well served by the caiques. The islands of Agri Olivado and Agios Georgios finalise the panorama (these islands are accessible by caiques). It is the most prominent tourist side of the island with the frequentation of the beaches. Many monasteries, churches or convents can be visited in addition to the most famous places of Chora (Apocalypse Cave and Saint John Monastery). They are based very often near the coasts such as Agios Nikolaos, Livadi Kalogirou, Agii Pantes, Panagia Geraniou, Stavros...). The monastery of nuns Zoodochos Pigis ready for Chora is our favourite (after the two religious pillars around St. John). Listen to the Orthodox sung services. They are famous there. Continue your visit to the North-West of the village going down to the beaches of Ormos Kipon. > The Holy Week (especially on Holy Thursday): we eat on this occasion the magiritsa (soup made with lamb tripe). Masses and processions, 12 monks represent the apostles of Christ and have their feet washed in public - ceremony of the Diptera. > The feast of Saint Pandemonium (27 July). Pilgrimage on the Chiliomodi islet. > The feast of the Transfiguration (6 August). In the village of Kampos, the musicians officiate the day before and we drink and eat together ouzo and mezzes. A Mass is celebrated. > On 15 August: the Virgin is celebrated, a big feast is organised in Kampos and a procession in Chora at the Zoodochos Pigis monastery. 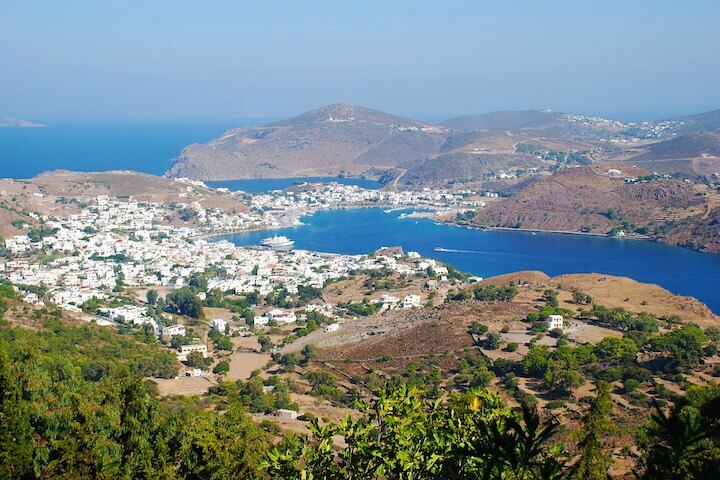 For a day or more, you can take the hydrofoil to reach the islands near Patmos. The island of Lipsi can be reached in 20 minutes by boat. 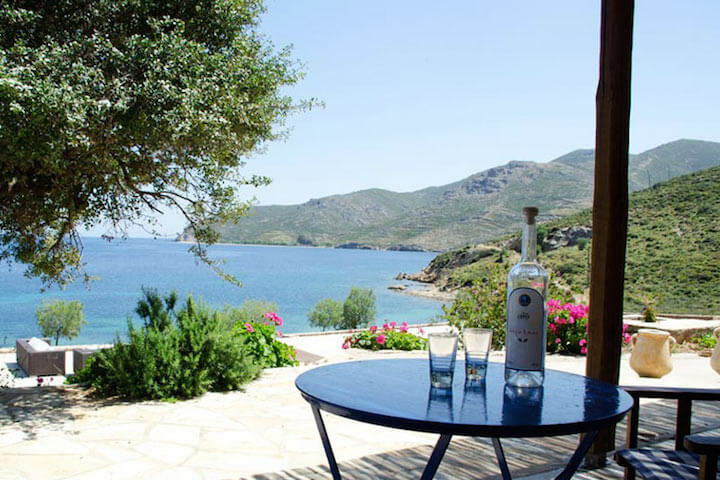 Entirely dedicated to wine and fishing, the island communicates the Greek soul in the blink of an eye. For more visits, the tourist office is very competent in Skala.